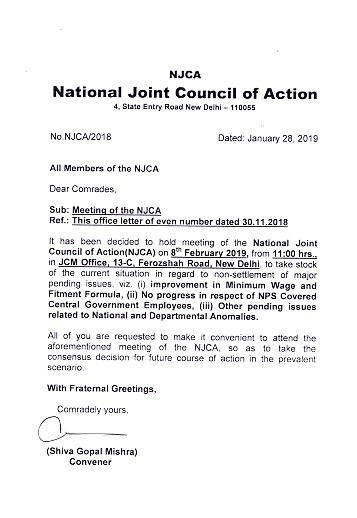 It has been decided to hold meeting of the National Joint Council of Action(NJCA) on 8th February 2019, from 11:00 hrs., in JCM Office, 13-C, Ferozshah Road. New Delhi to take stock of the current situation in regard to non-settlement of major Pending issues viz. (i) improvement in Minimum Wage and Fitment Formula, (ii) No progress in respect of NPS Covered Central Government Employees, (iii) Other pending issues related to National and Departmental Anomalies. 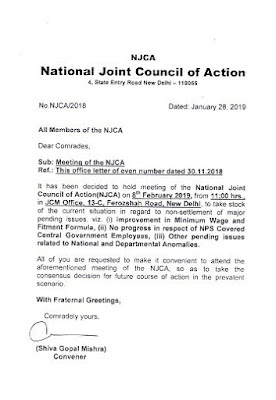 All of you are requested to make it convenient to attend the aforementioned meeting of Iho NJCA. so as to take the consensus decision for future course of action in the prevalent scenario.